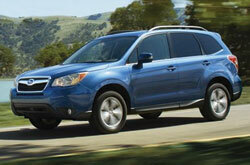 This year's U.S. News and World Report number-one ranked "Affordable Compact SUV" and "Affordable Crossover SUV" is the 2014 Subaru Forester. It's also Motor Trend's 2014 Sport/Utility of the Year. Over the course of our Subaru Forester review, we found that this all-new, fourth generation SUV offers the perfect combination of style, luxury and performance. As it's completely redesigned, it finally sheds its dated exterior in favor of a sleeker, more modern look that complements its upscale interior. The 2014 Subaru Forester in Kansas City continues to offer what has always made it such a hit amongst Missouri shoppers, namely its exceptional blend of utility, power and all-wheel drive capability. Subaru Forester drivers in Kansas City will find that it outperforms competitors like the Ford Escape, Honda CR-V and Hyundai Santa Fe Sport, all while offering a comparable level of refinement and value. The 2014 Subaru Forester is available in Kansas City for the new model year in six trim levels: 2.5i, 2.5i Premium, 2.5i Limited, 2.5i Touring, 2.0XT Premium and 2.0XT Touring. Each 2.5i trim level features a 2.5-liter "boxer" engine with 170 horsepower and 174 lb.-ft. of torque, and buyers can choose from manual or automatic CVT transmissions. Each of the two 2.0XT trims feature a turbocharged 2.0-liter "boxer" engine that generates 250 horsepower and 258 lb.-ft. of torque; it also comes standard with an automatic CVT transmission. During our Subaru Forester review we found that its new interior highlights and improvements really make this SUV a cut above the rest. Standard and optional features include: keyless start/entry, dual-zone automatic climate control, leather seats, heated front seats, touchscreen navigation, a panoramic sunroof, full power accessories, a rearview camera, an eight-speaker audio system, a power liftgate, adaptive cruise control and much more. 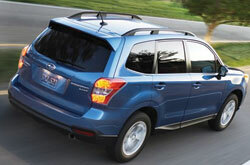 Continue reading the 2014 Subaru Forester review below or contact Van Subaru to arrange a test drive. The 2014 Hyundai Tucson, GMC Terrain, Volkswagen Tiguan, Chevrolet Equinox and the Ford Escape are outperformed by the 2014 Forester in a multitude areas. If the Forester's inexpensive MSRP and state-of-the-art onboard technologies don't convince you that it's the ideal vehicle for your needs, we're sure its pronounced design will seal the deal. 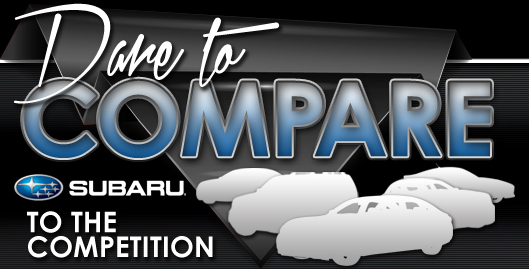 Hundreds of Kansas City Subaru drivers choose it because it's a spectacular value; just compare its price to the aforestated list of vehicles. For more details about what it offers, check out the Forester's quick-facts list underneath this text. Does the Forester have what you want out of a vehicle? Check out Van Subaru's overview above, as well as other 2014 Subaru reviews to find the ideal model for your needs. Good reviews are hard to find ; but as the reputable Subaru dealership in Kansas City we've put it all in one location for you. Everything perspective car buyers need to make wise decisions is right here, including info regarding cargo capacity and other specs. Each section is up to the hilt with invaluable information and specs - all at your fingertips. 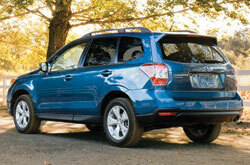 Thank you for reading Van Subaru's 2014 Forester review. Now that you know more about the Forester, reach out to us to learn about finance offers and national incentives that can help you save a substantial amount on your purchase.